From M6 motorway exit at junction 36 on A590 for South Lakes, Barrow-in-Furness, Kendal and Windermere. Follow dual carriageway for 5 miles, pass junction left for Barrow-in-Furness, continue on A591 dual carriageway for Kendal and Windermere. Pass Low Sizergh Barn Shop on right and layby with parking on left, then immediately get into outside lane for turn right across dual carriageway signposted Prizet. If you pass Prizet BP filling station and Travelodge you have gone too far and will have to come back on the other side of the carriageway. The hedged road (Hawes Lane) signposted Prizet from the dual carriageway is narrow and twisty. After ¼ mile along here first house on left is a bungalow called South View. 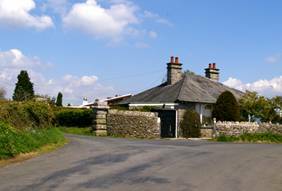 Take the track to the left of this house through stone gateposts and continue along short lane, Prizet Stables is third house on right. There is a B&B sign facing you on the gatepost. Turn right through sandstone gateposts and park in cobbled courtyard. If you missed the left turn and went down the hill and over the bridge to Natland village you went too far and will have to turn round at Natland. From Kendal south leave town through traffic lights on Milnthorpe Road on the A6, then A591, following signs for M6 and A590. On A591 going south, pass Prizet filling station and Travelodge. Immediately after filling station turn left signposted Prizet. The hedged road (Hawes Lane) signposted Prizet from the dual carriageway is narrow and twisty. After ¼ mile along here first house on left is a bungalow called South View. Take the track to the left of this house through stone gateposts and continue along short lane, Prizet Stables is third house on right. There is a B&B sign facing you on the gatepost. Turn right through sandstone gateposts and park in cobbled courtyard. If you missed the left turn and went down the hill and over the bridge to Natland village you went too far and will have to turn round at Natland. From Windermere follow A591 south past Kendal. Pass Prizet filling station and Travelodge. Immediately after filling station turn left signposted Prizet. The hedged road (Hawes Lane) signposted Prizet from the dual carriageway is narrow and twisty. After ¼ mile along here first house on left is a bungalow called South View. 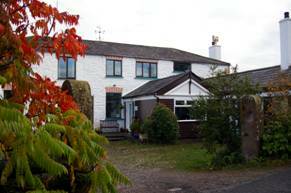 Take the track to the left of this house through stone gateposts and continue along short lane, Prizet Stables is third house on right. There is a B&B sign facing you on the gatepost. Turn right through sandstone gateposts and park in cobbled courtyard. If you missed the left turn and went down the hill and over the bridge to Natland village you went too far and will have to turn round at Natland. From A65 north of Endmoor, heading towards Kendal at Oxenholme, pass Texaco garage on right and road to Oxenholme station, then take next road left down twisty hill into village signposted Natland. At foot of hill pass St Mark’s Primary School, then village green on left. At junction by Natland Post Office turn right onto road for Kendal, then immediately left before new houses (Charnley Fold) and telephone box. This walled road is narrow and twisty and leads down to Hawes Bridge over the River Kent, then up towards the A591 dual carriageway. Don’t go as far as the main road but at top of hill turn right through stone gateposts by the bungalow (South View). Continue along short lane, Prizet Stables is third house on right. There is a B&B sign facing you on the gatepost. Turn right through sandstone gateposts and park in cobbled courtyard. Find us on multimap.com using postcode LA8 8AB.